In the 1950s and into the early 1960s barbecue and smoked meat was primarily a thing reserved to the Southern and Southeastern parts of the United States. As backyard grilling started gaining popularity, more and more aficionados of fire-kissed flavor started taking an interest in smoking their food. 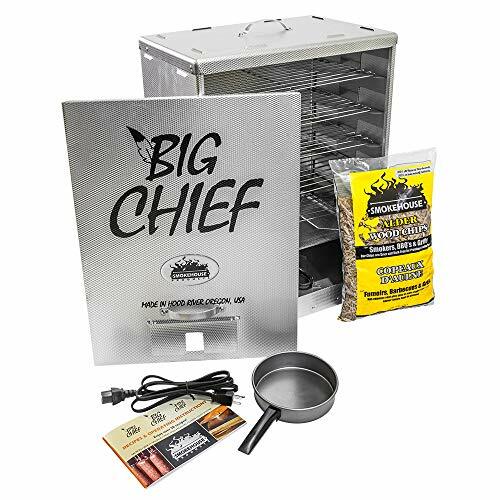 One of the first forays into offering an effective and affordable option for smoking meat at the retail level was the Big Chief. In the decades since it has grown to be a veritable icon of smoked meat. 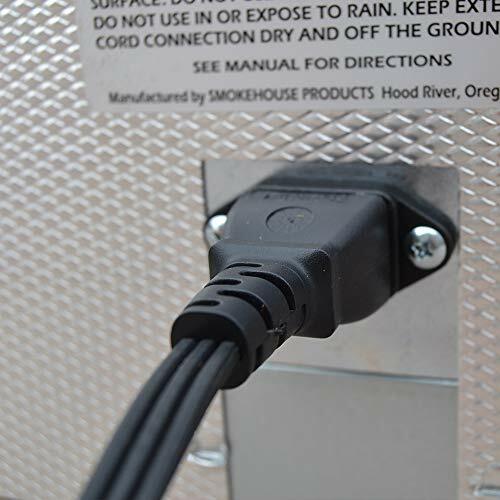 It is an electric smoker that runs on the same current running through your standard wall socket. The Big Chief operates at a consistent 165 degrees. This means it is a traditional smoker, sometimes referred to as a “Cold Smoker.” It isn’t a barbecue meant for hot smoking things like pork shoulders and briskets. It is made from embossed sheet aluminum comes with four chrome-plated grates, which provides it with a 50-pound capacity. The wood chip pan is large enough to handle a long smoking session. The easy to remove drip pan is dishwasher safe. It has been listed as safe meeting standards set by the Underwriters Laboratory as well as the CL ad CSA. 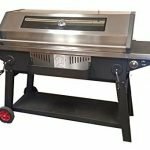 There are some online retailers who offer an expert assembly service for the Big Chief Smoker. In reality, it is incredibly easy to assemble, and even if you lack any mechanical skill, you should still be able to put it together in ten minutes, with the basic tools you have sitting around the house. 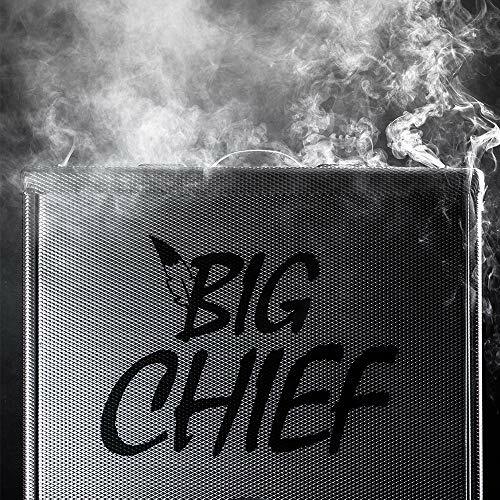 Materials-wise the Big Chief Smoker has never been and never will be a high-end item. It’s made from embossed aluminum without any traditional insulation. Still. This doesn’t mean it’s cheap, or short-lived. There are people today who have a Big Chief in their garage that still works a decade after they originally purchased it. 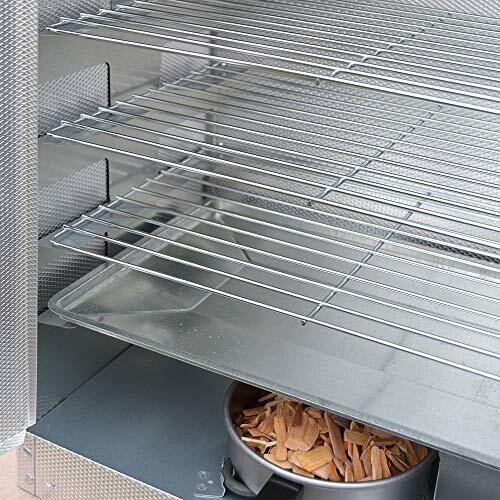 The first thing you have to keep in mind with the Big Chief Smoker is that it is meant to be a smoker, not a hot smoker barbecue. Its electric thermostat holds at a very consistent 165 degrees. This means it is perfect for adding smoky flavor to things like salmon fillets, shell-on shrimp, or infusing smoke into beef jerky before it goes in the dehydrator. It also does a great job of adding smoky flavor to homemade fresh sausage. If you’ve ever wanted to try your hand at smoking your own cured pork belly for homemade bacon, the Big Chief will do an excellent job. It’s also capable of producing pastrami that will make your knees weak. When it comes to hot smoke applications, like classic barbecue, 165 degrees just isn’t hot enough to render collagen and cook through a big piece of meat. It’s just isn’t designed to make a pork shoulder or a brisket, which needs temperatures in the 200-250 degree. That being said, if you own a Big Chief, and you are just dying to enjoy some smoked brisket or pork shoulder, there are a few tricks you can try. With smoked meat, the fat is primarily what is delivering the smoke deep into the meat. The more fat a piece of meat has, the more smoke it can take on. With your average pork shoulder, it takes in something like 70% of its total smoke saturation in four to five hours. This means you could put a pork shoulder in the Big Chief, and smoke it for four hours. Then place it in an oven, tented with foil, and let it finish for another four or so hours at 225 degrees. The end result is pretty close to what you would get with a hot barbecue smoker. Just don’t plan on competition barbecue. The fact that the Big Chief is not insulated helps keep it at a friendly price point. Yet it also means that the internal temperature is going to be in competition with the temperature of the outside world. On a cold day, the Big Chief might struggle to hold at 165 degrees, or smoking times may take longer. 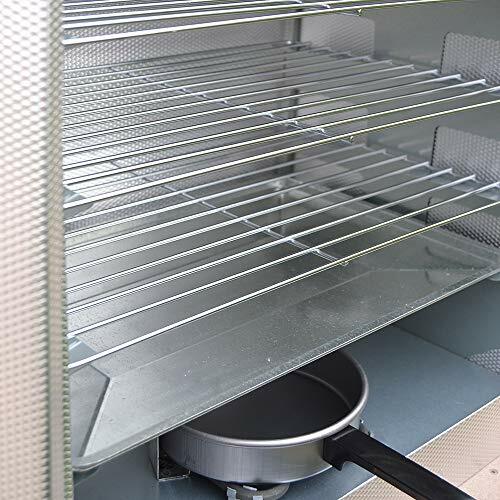 Each of the four chrome plated grill grates provides 121 square inches of space. The maximum weight capacity of a fully loaded Big Chief is 50 pounds. This makes it a great option for smoking your fresh caught salmon, or trout. The Big Chief isn’t hard to clean. Anything that gets stuck on the chrome plated grates will need to be scraped off. Wiping down the interior from time to time to take away any loose residue will also help keep it clean. Beyond that, the wood chip cup simply needs to be emptied out. The drippings pan has been re-engineered from the original 1968 version so that it is now dishwasher safe. 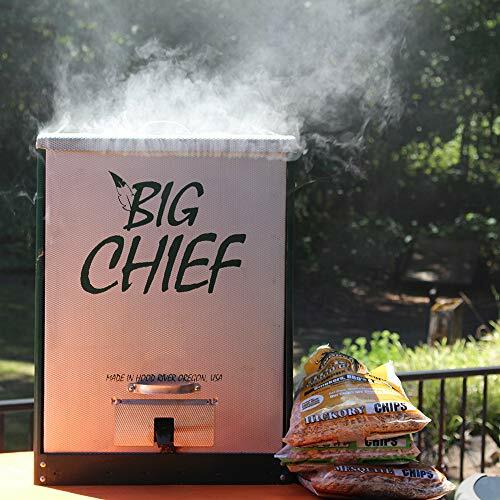 The Big Chief Smoker comes with a 2-year limited warranty. 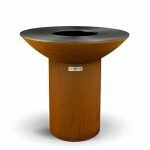 This is a little better than competitor smokers in this same price range. 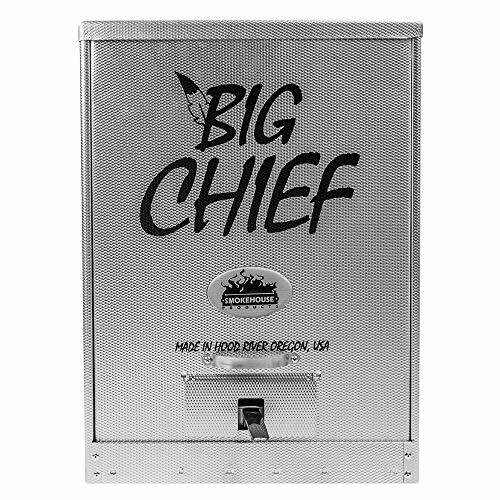 The Big Chief is an American classic smoker, built in the USA. 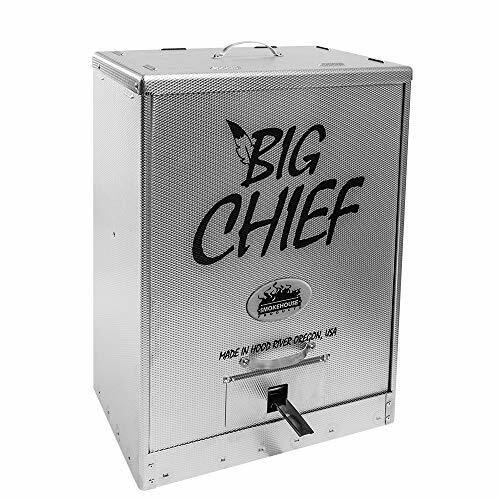 If you are looking for a traditional smoker to handle what is often called a “Cold Smoking” application, then it’s hard to look past the Big Chief’s reputation and friendly price tag. Just keep in mind that you aren’t going to be hot smoking a pork shoulder, brisket, or ribs, without at least giving them some time inside an oven. The Big Chief really is meant for things like smoking fish to perfection or adding smoke to a homemade ring and link sausages. If you want to play with other cold smoking applications, it certainly should be on your list. With a Big Chief in your arsenal, you can make your own homemade bacon, pastrami, shell-on shrimp, smoked jalapenos, and even a fresh country ham!